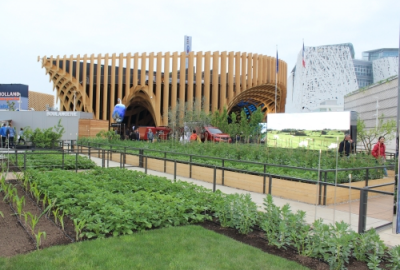 To illustrate the French agricultural initiatives, the French Pavilion has selected a major innovation of Terrena named AgriCO2. This system encourages farmers to reduce their emissions of greenhouse gases through the implementation of new practices from Ecologically Intensive Farming, to produce more and better with less. Visitors will discover from 17th to 30th September how Terrena’s farmers involved in this system act to reduce greenhouse gases. What is AgriCO2 system ? In France, agriculture is responsible for around 20% of greenhouse gases (translated into tonnes of CO2 as emissions into the atmosphere) with diffuse emissions. The INRA has identified ten measures which have a positive impact in reducing CO2 emissions through agricultural practices. The ten measures are centred around nitrogen management (nitrogen fertilizer, pulses), practices that help increase carbon sequestration in soil and biomass (fallow land, agroforestry, intermediate crops and intercropping, pasture management), animal feed (rations that minimise nitrogen excretion or methane production) and the production and consumption of energy by farming (methanization, fossil fuel economies). From these, Terrena has selected for 2014 seven techniques where the reduction in CO2 can be quantified. The AgriCO2 system covers the selected techniques and calculates each year how much CO2 has been reduced by member farmers who have committed to using these techniques. In 2014, 1900 farmers involved in this system have saved 8,000 tonnes of CO2. This is the equivalent of 50 million kilometers traveled by car. In 2015, the objective will be to mobilize 2400 farmers for a total savings of 15,000 tonnes of CO2. This will be the equivalent of 90 million kilometers traveled by car.